Qatar is still failing to protect the rights of its army of nearly two million migrant workers, a report by Amnesty International has claimed. The Gulf state's population has exploded since it won the right to stage the 2022 World Cup in a controversial vote by football's governing body FIFA in December 2010. "The Qatari authorities have been taking some important steps to protect labour rights, but much more needs to be done. "Holes in the reforms to date mean many workers are still stuck in harsh conditions, vulnerable to exploitation and abuse, while those who return home do so empty-handed, with no compensation and no justice." The report acknowledges that the Qatari authorities have passed new laws to improve workers' rights since signing an agreement with the United Nations' International Labour Organisation in November 2017. Foremost, these changes was the scrapping of the most notorious element of the 'kafala' sponsorship system - which meant any migrant worker who wished to go home would need their employer to consent to an 'exit permit'. New laws have also introduced a temporary minimum wage, created a workers' insurance fund and set up committees to address disputes. But Amnesty International, and other human rights groups, believe kafala has not been completely dismantled, as workers still cannot change jobs without their employers' permission and risk having passports confiscated if they 'abscond'. It is also pointed out that the temporary minimum wage for those building the country's infrastructure is around £155 per month, while the new labour courts set up to tackle the non-payment of wages and other complaints are overwhelmed. The report calls for "fundamental reform" of the sponsorship system, a strengthening of measures to make sure workers are paid in full and on time, improved enforcement of the new laws, proper funding for the dispute resolution committees so they can keep up with the workload, a green light to form trade unions and better protection for domestic workers. Neither the Qatari government nor the World Cup's organising committee has responded yet to PA Sport's requests for comment. 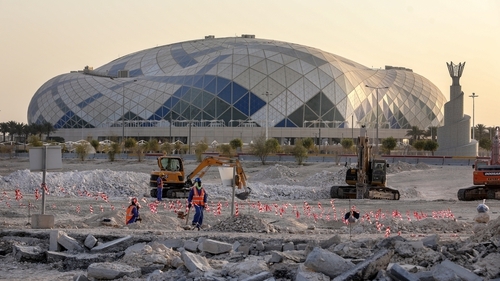 Qatar is building seven new stadiums and renovating one in order to stage the 2022 World Cup, which has been moved to the winter because of concerns about the Gulf peninsula's extreme summer heat. In fact, the country's climate has been partly blamed by experts for high mortality rates among migrant construction workers. Preparations for the tournament have also been complicated by a bitter 19-month diplomatic row with Qatar's neighbours, although that did not stop the country from claiming its finest footballing achievement last week when it won the Asian Cup for the first time, going undefeated through the tournament and beating Japan in the final.